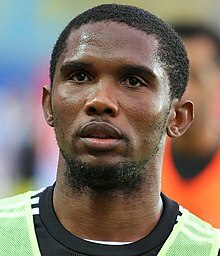 Samuel Eto'o Fils (French pronunciation: ​[samɥɛl eto fis]; born 10 Mairch 1981) is a Cameroonian fitbawer who plays as a striker for Turkis club Konyaspor. Eto'o trained at Kadji Sports Academy. He an aa haulds a Spainyie passport, enablin him nae tae coont amang the "foreign players" wirkin in the European Union. ↑ "In Cameroon, Samuel Eto'o Reigns as Uncrowned King – Photo Essays". Time. 2 June 2010.